Vaping is all about convenience and satisfaction, and with pop-and-go capsules pre-filled with e-liquid for an easy and mess-free experience, nobody does it better than Logic PRO. 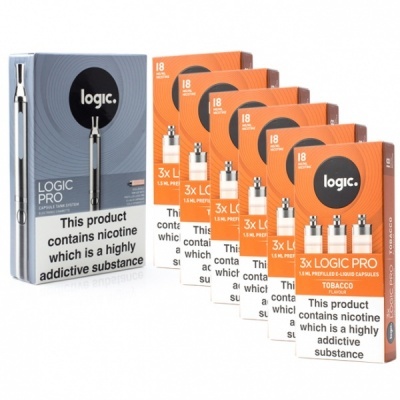 The Logic PRO E-Cigarette Tobacco 18mg Combination Pack includes a Logic PRO device along with six packs of Tobacco Refill Capsules, letting you enjoy premium vapour right out of the box. What's Included in this Combination Pack? Why Choose a Logic PRO Combination Pack? How Do I Use the Logic Pro? The Logic PRO Tobacco e-liquid is packed with the bold flavour of rich Brazilian tobacco. Perfect for transitioning from traditional cigarettes, this flavour is sure to satisfy with rich woody character and warm overtones. Logic PRO refill capsules are filled with 1.5ml of e-liquid and are available in 0mg, 6mg, 12mg and 18mg strengths. The e-liquid capsules included with this Combination Pack are provided in a 18mg strength, considered a high amount of nicotine. One of the main advantages of the Logic PRO over other e-cigarettes and vape pens is its powerful 650mAh battery. This battery outperforms most others in its class, and will comfortably last through a day of vaping for most users.